Maria Lichty has loved to cook ever since she was a little girl helping her father in the kitchen. But she never dreamed that cooking would turn into her full-time family business. 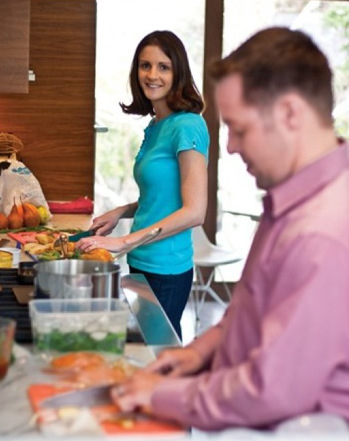 Maria and her husband Josh are the original two peas of Two Peas and Their Pod, a food blog, and much more, for the everyday cook. On the blog, the couple shares their culinary adventures. Maria says they thrive when cooking up a storm together in their dream kitchen. And yes, Josh really is the co-captain. Josh and Maria were friends first before getting married in 2008. And it was shortly afterward that Maria started posting some of their shared recipes and food photos on Josh’s personal blog. When family and friends (and even strangers) started expressing how much they enjoyed the posts and asking for more, they transitioned Josh’s old blog to a full time food blog. Josh came up with the name and Two Peas and Their Pod was born. It wasn’t long before more people started flocking to the site and Maria, who at one time had trouble logging in to the blog on her own, was able to transition into working full time online. And in addition to steadily collecting a group of very loyal followers/subscribers, they were soon featured in big time publications like LA Times and CNN. Most people leave the food preparation to professionals when planning a wedding. But Maria and Josh, whose passion is preparing food, decided that they would take on the task for their big day. “Cooking relaxes me,” Maria said. So while most brides would meltdown if they had to worry about the catering, Maria knew that preparing food would help her relax. While they ended up hiring out a gelato bar, they prepared their own baked goods section for their guests to enjoy. When we asked her about her favorite food/recipe, she replied “cookies” without a second thought. The holidays are huge for their blog, and that’s when the cookie recipes usually make an appearance. To date, they have about 200 cookie recipes on Two Peas and Their Pod. Other than that, Maria is a vegetarian, so she shares a lot of vegetarian-friendly recipes with her readers. Josh eats meat, so he takes care of the occasional meat posts. According to Maria, inspiration for recipes comes from all over. It can come from family, friends or from any of the many places they’ve traveled to, for starters. If we’re out and about at a restaurant and we try something we really like, we try to recreate it at home or do a twist on something. Same with cookbooks and magazines if we see something we can try to recreate or gives us an idea. [Mostly] we just bounce ideas off of each other. Maria says she keeps most of her recipe ideas in a notebook that Josh gave her. I’d wake him up in the middle of the night and be like “what do you think about this cookie?” And he’d say, “seriously? Go back to sleep.” I’m just constantly thinking about food so he got me this little journal so I can write down my ideas and stop waking him up in the middle of the night. A few years after they got married, Josh and Maria welcomed a third pea to their pod. Little Caleb may only be a toddler, but he’s already a big fan of helping out in the kitchen. Maria says he loves to pull out his own little frying pan and say, “let’s make quesadillas!” He’s also not very picky, as his parents expose him to all sorts of delicious food – none of which is prepackaged. This year, they’ll also be welcoming another future chef. Maria conceded that trying to cook on a normal basis while in her first trimester of pregnancy was very difficult. She could barely stand being in the kitchen with all of the different food smells. So teamwork really came in handy at that time. Josh was able to do most of the cooking while Maria focused on writing. When Maria and Josh were first approached by a company to run a giveaway, online giveaways were a pretty new thing and they were excited to hop on the bandwagon. And while they still love running giveaways to this day, they’ve become a bit more selective about the companies they work with and the giveaways they run. We’re pretty picky about the giveaways we do. We only work with companies that we use and love, and know that our readers would love too. On Two Peas and Their Pod, you’re likely to see a giveaway featured about once a month, with more occurring during big holidays and special events. Maria says that they don’t want to overwhelm their audiences by bombarding them with giveaways. They want their readers to feel like it’s truly worth their while to enter for the chance to win something really special. Right now, they’re focusing on increasing their email subscribers, but they really like to use as many of the PromoSimple bonus entry methods as possible. It’s nice to grow in all the different areas. People are active in all different social media platforms and everyone has their favorite thing. So it’s nice to find people a little bit of everywhere. In addition to carefully choosing the products that are given away on the site they include relevant actions that engage their entrants. For instance, within their Breville Juicer Giveaway users were given an extra entry for providing an answer to the question “What is your favorite juice?”. This simple entry option helps the campaign performance by asking them for their feedback about the product. In addition, the information gathered could easily be used in future content and blog posts.